B OARD OF DI RECTO R S Bill Peterson Board Chair Penny Heller First Vice Chair Kirstin Turner Second Vice Chair Heather B. Ferguson Secretary John C. Elder Treasurer Chris Oberlink Member-At-Large Lynda M. Murphy Member-At-Large Garth E. Rosenkrance Immediate Past President Matthew Constantine Chief Executive Officer Sean P. Bresnan John C. Castronuovo Thomas C. Frankel John P. Marasco Cristina Núñez de Landaluce Jeffrey W. Preston Elizabeth Morales Dana Perez, Chief Financial Officer, ex-officio Adopt-A-Family is a 501(c) (3) not-for-profit, charitable organization established in 1983. Our mission is to strengthen families with children in their efforts to achieve stability and self-sufficiency by providing access to all-encompassing services. 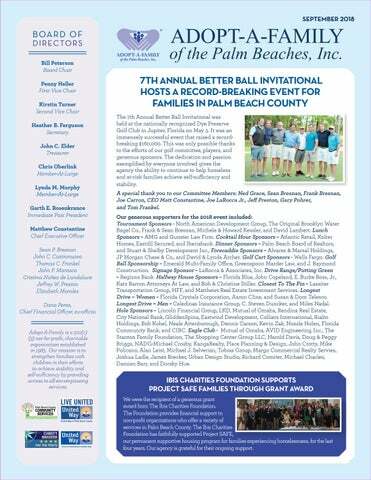 of the Palm Beaches, Inc. 7TH ANNUAL BETTER BALL INVITATIONAL HOSTS A RECORD-BREAKING EVENT FOR FAMILIES IN PALM BEACH COUNTY The 7th Annual Better Ball Invitational was held at the nationally recognized Dye Preserve Golf Club in Jupiter, Florida on May 3. It was an immensely successful event that raised a recordbreaking $160,000. This was only possible thanks to the efforts of our golf committee, players, and generous sponsors. The dedication and passion exemplified by everyone involved gives the agency the ability to continue to help homeless and at-risk families achieve self-sufficiency and stability. A special thank you to our Committee Members: Ned Grace, Sean Bresnan, Frank Bresnan, Joe Carron, CEO Matt Constantine, Joe LaRocca Jr., Jeff Preston, Gary Pohrer, and Tom Frankel. Our generous supporters for the 2018 event included: Tournament Sponsors - North American Development Group, The Original Brooklyn Water Bagel Co., Frank & Sean Bresnan, Michele & Howard Kessler, and David Lambert. Lunch Sponsors – AMG and Gunster Law Firm. Cocktail Hour Sponsors – Atlantic Retail, Kolter Homes, Eastdil Secured, and Iberiabank. Dinner Sponsors – Palm Beach Board of Realtors, and Stuart & Shelby Development Inc., Forecaddie Sponsors – Alvarez & Marsal Holdings, JP Morgan Chase & Co., and David & Lynda Archer. Golf Cart Sponsors - Wells Fargo. Golf Ball Sponsorship – Emerald Multi-Family Office, Greenspoon Marder Law, and J. Raymond Construction. Signage Sponsor – LaRocca & Associates, Inc. Drive Range/Putting Green – Regions Bank. Halfway House Sponsors – Florida Blue, John Copeland, E. Burke Ross, Jr., Katz Barron Attorneys At Law, and Bob & Christine Stiller. Closest To The Pin – Lassiter Transportation Group, HFF, and Matthews Real Estate Investment Services. Longest Drive – Women – Florida Crystals Corporation, Aaron Cline, and Susan & Dom Telesco. Longest Drive – Men – Celedinas Insurance Group, C. Steven Duncker, and Miles Nadal. Hole Sponsors – Lincoln Financial Group, LKD, Mutual of Omaha, Rendina Real Estate, City National Bank, GliddenSpina, Eastwind Development, Colliers International, Rialto Holdings, Bob Kobel, Neale Attenborough, Dennis Carson, Kevin Zak, Nozzle Nolen, Florida Community Bank, and CIBC. Eagle Club - Mutual of Omaha, AVID Engineering, Inc., The Stanton Family Foundation, The Shopping Center Group LLC, Harold Davis, Doug & Peggy Briggs, NADG-Michael Crosby, KangaRealty, Place Planning & Design, John Crotty, Mike Policano, Alan Leist, Michael J. Selverian, Tobias Group, Margo Commercial Realty Servies, Joshua Ladle, James Brecker, Urban Design Studio, Richard Comiter, Michael Charles, Damien Barr, and Dorsky Hue. IBIS CHARITIES FOUNDATION SUPPORTS PROJECT SAFE FAMILIES THROUGH GRANT AWARD We were the recipient of a generous grant award from The Ibis Charities Foundation. The Foundation provides financial support to non-profit organizations who offer a variety of services in Palm Beach County. The Ibis Charities Foundation has faithfully supported Project SAFE, our permanent supportive housing program for families experiencing homelessness, for the last four years. Our agency is grateful for their ongoing support. WILEY REYNOLDS SOCIETY RECOGNITION EVENT On April 26, we gathered to thank and honor our Wiley Reynolds Society members and community supporters. Adopt-A-Family staff and Society members look forward to this event each year, as it is a reminder of the donor impact in the community as well as the agency’s opportunity to give thanks to the members for their dedication to the agency’s mission. The highlight of the evening was the presentation of awards to two dedicated agency volunteers. Chris Oberlink was presented the Wiley Reynolds Society Award. Chris has dedicated her life to our mission and has been at the forefront of every Adopt-A-Family milestone. Heather Ferguson was awarded the Crystal Castor Award for Outstanding Volunteer. Heather’s caring spirit and unyielding commitment are what makes her a blessing to our agency and to the families we serve. Chris and Heather, the staff and clients of the agency are eternally grateful for all that you have done and continue to do. Over the years, BankUnited has been an incredible partner to Adopt-AFamily. They have taught Financial Literacy classes to adult residents and Project Grow kids and sponsored and volunteered at Movie Night on the Turf. Most recently, BankUnited stopped by our office to present a grant award to the agency that will go directly to our Service Enriched Housing program, which they have supported for the last 3 years. Thank you, BankUnited, for all that you do to assist our families. Every year, AdoptA-Family is amazed by the support of our community during the Great Give fundraiser, and this year was no different. In only 24 hours, we received 183 generous donations, 65 of those donations were from first-time donors, and through kindhearted support, the agency raised over $19,000 to benefit Project Grow. We want to express our gratitude to the board of directors for their support throughout the campaign as well as our staff, volunteers, and community members who shared or donated to our campaign. 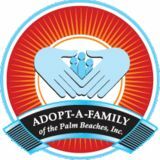 Adopt-A-Family participated in the City of West Palm Beach’s Summer In Paradise program, for the second year in a row. In partnership with Habitat for Humanity, this year’s theme was Affordable Housing. Local artists partnered with nonprofits to create children’s playhouses, inspired by classic fairytales. Our artist, Freddy Hennevelt, blew everyone away with his creative design of the Hans Christian Andersen classic, “The Ugly Duckling.” The playhouses were on display from June 7 until July 26, when a public auction was held and proceeds from our playhouse went directly to the organization. Congratulations to the individuals who completed the First Time Homebuyers course in June! They are now one step closer to homeownership. The course is offered twice a year to all Adopt-A-Family clients and taught by the Service Enriched Housing Program Manager. The classes cover topics such as budgeting, credit repair, and mortgages. We are proud of them for taking the initiative to continue learning and striving toward self-sufficiency and homeownership. PROJECT GROW SUMMER CAMP ROUNDUP Summer Camp in Project Grow was so much fun! Thanks to dedicated supporters and funders, Project Grow campers embarked on numerous, exciting field trips and had organizations engage in fun experiments and projects with them right here at our Lake Worth office. Some of our highlights from the summer include trips to The Frost Museum in Miami, deep sea fishing with Florida Fishing Academy, The Fort Lauderdale Museum of Discovery and Science, The Delray Beach Playhouse, and Storytime Soccer. We want to give a special thanks to The Episcopal Church of BethesdaBy-the-Sea who generously provided grant funds to enrich and bolster summer camp activities for our students. On July 18, we presented the site plan and construction application for Third Avenue Homes to the City of Lake Worth Planning and Zoning Board and received official approval for the project. The Development Team is hard at work on the construction drawings which are expected to be finished by mid September. We are still on track to break ground before the end of 2018. For more information, contact Matthew Constantine at mconstantine@aafpbc.org. I began working toward early in my high school years.” As a busy high school senior, community volunteer, and nursing home employee, Erlande also successfully earned her Certified Nursing Assistant (CNA), EKG tech, and Medical Assistant licenses through a rigorous program offered through her high school. Erlande’s resilience, academic and professional success, and commitment to community volunteerism caught the eyes of two local patrons of The Episcopal Church of BethesdaBy-the-Sea, who became significant mentors in her life. Soon afterward, Erlande was honored with a tuition-scholarship from The Episcopal Church of Bethesda-By-the-Sea in addition to scholarship support from Florida State University where she is now a sophomore studying nursing. Even after sharing her many successes, Erlande has one focus on her mind—how she can impact her hometown. “Project Grow and Lake Worth had a gigantic impact on my childhood,” said Erlande in closing. “Lake Worth is where I was born and raised, however, you always want to become someone better than you grew up around. Even though I’ve gone through things that were so difficult and hurtful, I see myself back here in ten years giving back to this community (hopefully as a neonatal intensive care nurse).” We congratulate Erlande and wish her well on her incredible journey forward!